The timing of this series, with its critique of corruption by those in authority must have been ordered by the topical gods. In the week that, twenty-seven years too late the family of Hillsborough received their first step to justice, in this fictional land the sexual abuse victims are still to get their justice because of cover ups. Will they in the end? And speaking of corruption, will the Caddy finally get found out or will he be let loose on the course for series FOOOOUR?! Little golf joke for you there to lighten the mood. 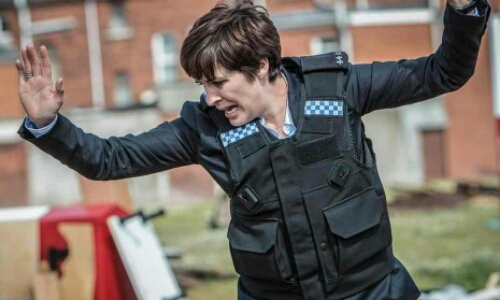 When a series finale has so many threads to tie together they are rarely completely satisfying, Line Of Duty has set itself the un-thankable task of doing this with three whole series. Jed Mercurio has played the long game while running off at what seemed to be either tangents or actually not even connected at all. He’s pulled the wool over our eyes and we’re bleating with joy at all the twists, turns and lingering close-ups of worried faces. From the aching suspense to the masterful direction (take Cottan’s feet approaching the stairs on his way to arrest Steve) the atmosphere is palpable. The nerves and angst reach out from the screen and strangle our emotions. The core of this ninety-minute monster has two interviews as its centrepiece. First up the knife is twisting on Arnott as he’s paraded before his work colleagues. In twenty-three glorious minutes he’s subjected to Cottan’s planted evidence – and his confusion soon spirals to anger. Everyone is bloody marvellous. Martin Compston‘s panic, Dot’s cool smugness, Ted’s controlled anger and Kate’s steady nerve as her doubts mount. The interrogation ebbs and flows through a barrel of statistics, information, shouting and silence. We all screamed as one at the telly as Steve challenges Dot on his working practices. We scream at the screen for Kate to work it out. We scream at the screen for Ted to twig what’s wrong and when Dot let’s slip about the envelope we punch the air. Well, I did anyway. Brilliantly there barely any music going on to alter our mood, just gut-wrenching, aching and writing of the highest calibre. There were plenty more showdowns than the headlining acts and Ted soon tears into Cottan for sequestering evidence. He is on the warpath and armed with morality. He’s Hastings, “like the battle” after all. Gill is next in the firing line (a firing line, that’s what started all this kerfuffle) and when he tears into her with “Why don’t you write a nice letter of resignation to the PCC or I’ll swear to god I will drag you down with the rest of them” we all punch the air. There was also Cottan’s show down with his imagination when Lindsay appears to his cold sweated self in zombie like form (The Walking Denton?). This was the only thing that felt slightly out of place, as if air lifted in from another show but its purpose was clear – to show that even a person who is inherently bad has a conscience. So to the headline act, Dot who has wormed his way from the short grass of series one to become the show’s main player and who is now the one on the other side of the table under questioning from the ever diminishing AC-12. True to form he is calm and calculated at first but thanks to Nige and his “imm-un-i-ty” it starts unravelling and when Ted says DI” Cottan stay right there…” it’s a heart stopping moment. Kate has clearly regained her poker face and we discover that she’s been looking into Dot’s behaviour as well. With workmates like these who needs enemies? And then the twist of twists.. under the guise of looking at the calendar on his phone, Dot sends three words. Not ‘I love you’ to Kate (it’s safe to say the whole will they/won’t they ship had pretty much sailed) but “urgent exit required”. All of a sudden one of the armed guards is shooting the place down as Dot makes a run for it. Nobody shiftily sips water like Craig Parkinson. Sir, we will miss you. Is it normal to go round calling everyone ‘fella’? and if not I’m not going to stop doing it. I never liked Gill, which proves I’m an excellent judge of fictional characters. Kate has taken to guns almost as quickly as Danny carked it. Everything was wrapped up nicely but for Hari’s story. He just disappeared. What happened to him? Lovely moment with Nige and his lawnmower. Gardening has never been so poetic. Promotion for Maneet in series four please.